Thank you all for sharing such a fun year with me! 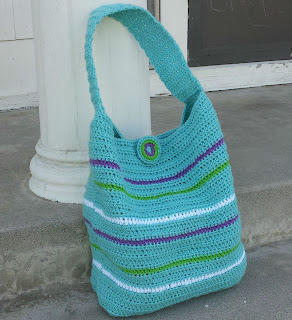 You can find more fun free crochet patterns HERE on my Free Crochet Pattern Page! I wish you happiness and luck and amazing adventures in the upcoming year! Love, love, love to you both now and in 2014, Sweet Dynamos! My Christmas was so much fun. 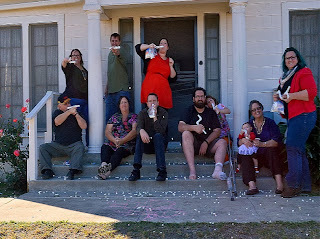 We had a marshmallow fight with THESE marshmallow shooters (they were so easy to put together! I made a dozen in an hour! 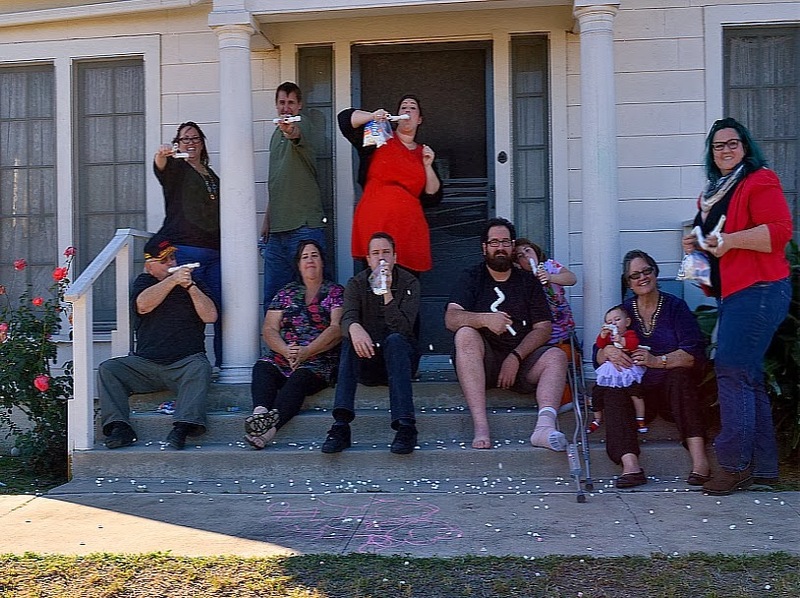 ), and even though Jake chipped a bone in his ankle playing with his nephews a couple of days ago, he was able to shoot from the porch. Mims came up with several accuracy games for us to play with them, and it wasn't until much later that she admitted it was her strategy to get us to waste all of our ammunition so she would "win". LOL! Diabolical! I hope your holiday was just as much fun! I recently just passed the 3k mark for Facebook followers! Yay! I am overjoyed and very grateful for all of the love and support! I have the best Dynamos in the world, and I love each and every one of you! Unfortunately, recent changes to Facebook have made it so that my posts only reach a little less than 10% of you lovely followers, so if you want to know about new posts and patterns you have to actually seek out my Facebook page (and honestly, who's going to do that?). According to THIS article on AdAge, Facebook would like me to pay to "boost" the reach those posts (which is totally their right, and I'm not complaining). 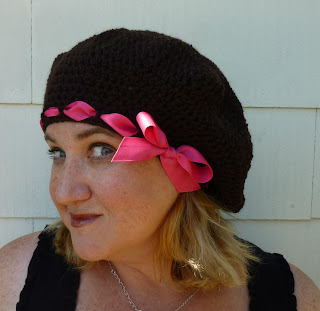 It just doesn't make financial sense to me to pay for advertising when I'm using Facebook as a way to let you know I've posted a new free pattern. I am still going to use Facebook, I love it and I think it's an amazing way to connect with all of you. But if you'd like to get notified when I put up a new post, please consider signing up to follow me by email! It's not spam, I'm not going to market to you, all it does is send my posts directly to your email box. You'll never miss a post, and it won't cost me a cent! Win-win, right?! The box to sign up to follow by email is on the right sidebar! 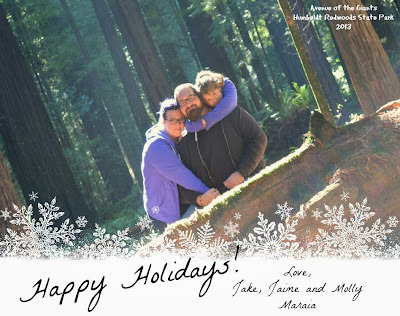 I didn't send out Christmas cards this year (or last year, come to think of it! LOL!!). Lucky for me, all of the people who I would send cards to read my blog! So, on this most merry of days, I am sending you all of my love and the very best holiday wishes. My niece is 8 months old. 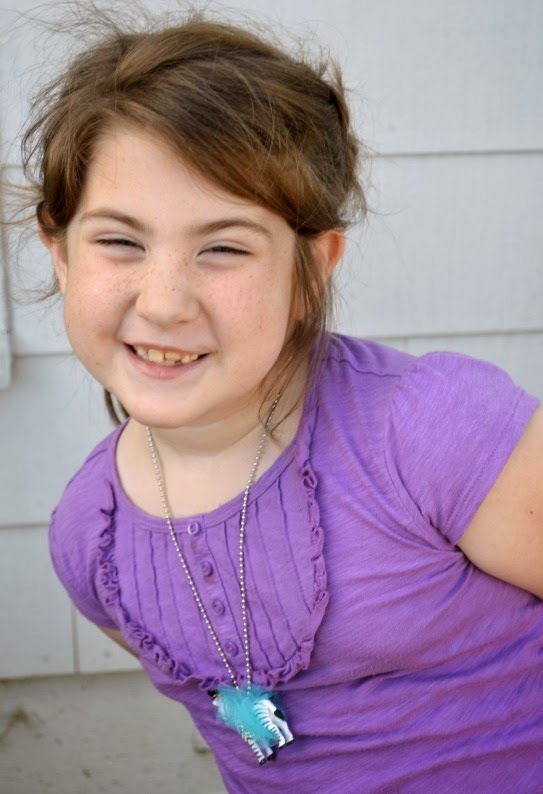 Her parents are very successful and she doesn't need anything. ANYTHING! All of her wants and needs have been taken care of. This leaves me in a bit of a pickle. What do you get for a baby that already has everything?! 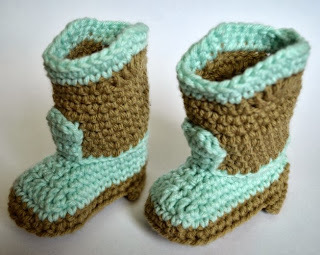 I made the boots using THIS pattern from The Crochet Crowd. I LOVE the little heel!!!! These were supposed to be Mary Janes, but I thought they were so adorable without the strap, they looked like little flats. So I have left it off. 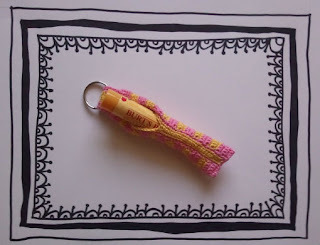 The "cuff" part was really long on this pattern (unnecessarily long, in my opinion, unless you were making them for an abnormally long-legged baby) so I modified it. If you've got a baby with normal sized legs you might want to try it my way too! 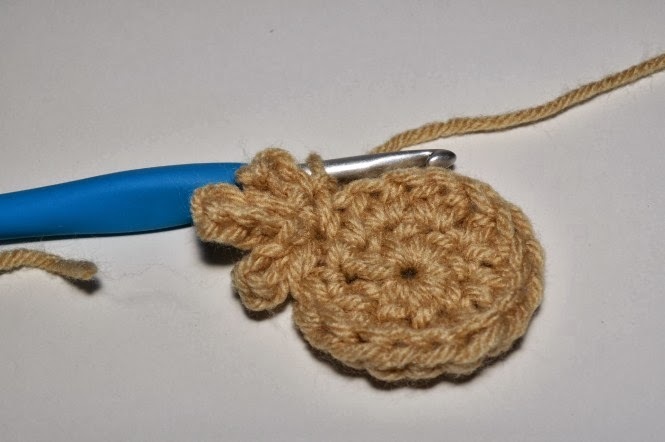 I used THIS pattern (also from The Crochet Crowd). Finish with Trim as written, and add a strap if you prefer. 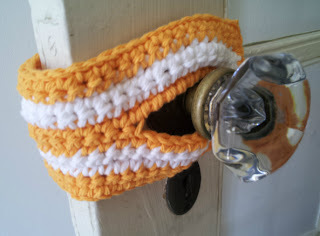 Crochet Dynamite recently passed the 3k mark for Facebook followers! Yay! I am overjoyed and very grateful for all of the love and support! I have the best Dynamos in the world, and I love each and every one of you! I love paperclip ice skates. I do. I love that they look old fashioned and vintage and they remind me of some that my grandma hung on her tree when I was a kid. 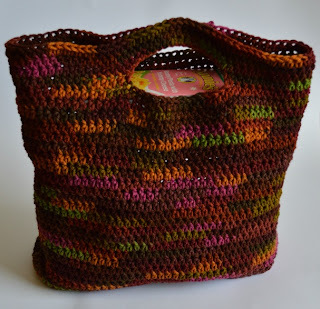 I really liked THIS pattern by Suzetta Williams (it's free, and her site is cute! ), and it inspired my own version of paperclip ice skates. Mine look a little more like the ones I remember from my grandma's tree, and they are so ridiculously quick to make I think I'm going to use them as present toppers this year too! I got my jumbo paperclips at my local Dollar Tree, 80 for $1. Score! Fasten off, leaving a 4" tail for tying later. Weave in all of the other loose ends. 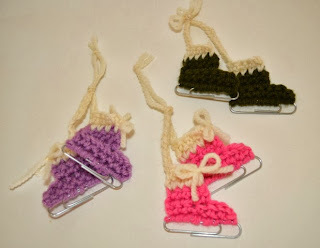 Tie your two skates together as close to the chain stitches as possible. Leave a 2" gap and make another knot. Trim excess yarn ends from the top. I also made an ice skate bookmark, by chaining 40 at the end of R6 and tying a matching pom pom to it. 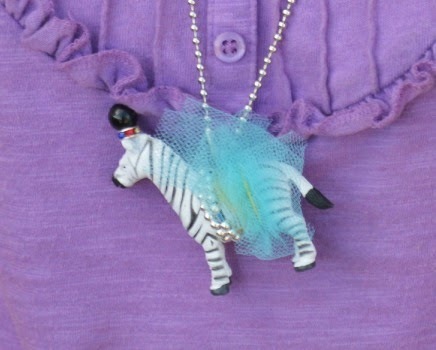 It is so cute!! 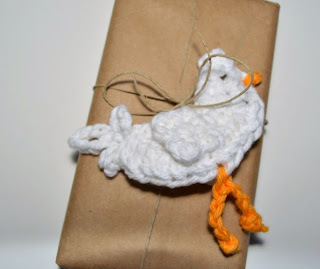 I think I'm going to make some to go in all of the books I give this year... probably not for the guys... LOL!! My niece is almost 8 months old! I can hardly believe it, this year has gone by so quickly. Katy-bug is teething right now, and even though none of them have broken through yet the first one is close. I decided to make her a set of teething rings for Christmas. 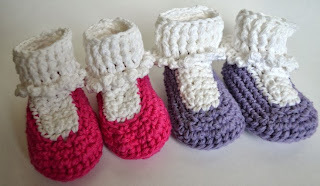 I made them out of cotton so they'd feel good on her gums, and her mom could wash them over and over. I also gave them a nice long cord so that her mom could tie the rings to Katy's stroller, car seat or even wear them as a teething necklace while she's holding Katy. Fasten off. Leave a 12" tail. 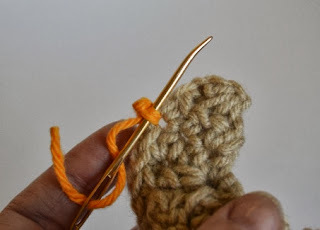 Fold the link in half lengthwise (like a hot dog) and whipstitch the sides together. 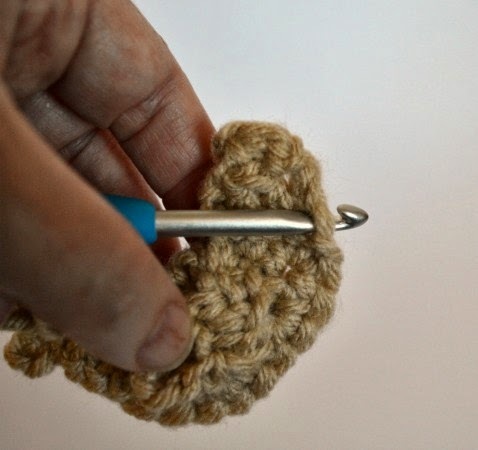 Curl the link into a circle and whipstitch the ends together to finish the circle. Weave in the ends. 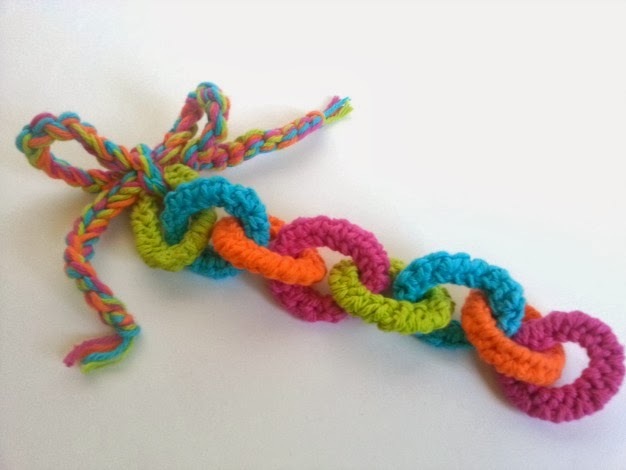 Make 7 more, forming them into a chain by linking them together before whipstitching the ends closed. Mims is in a matching-with-Mom phase right now. We wear matching outfits at least once a week, and we have matching purple hoodies for the times that matching whole outfits is impractical. 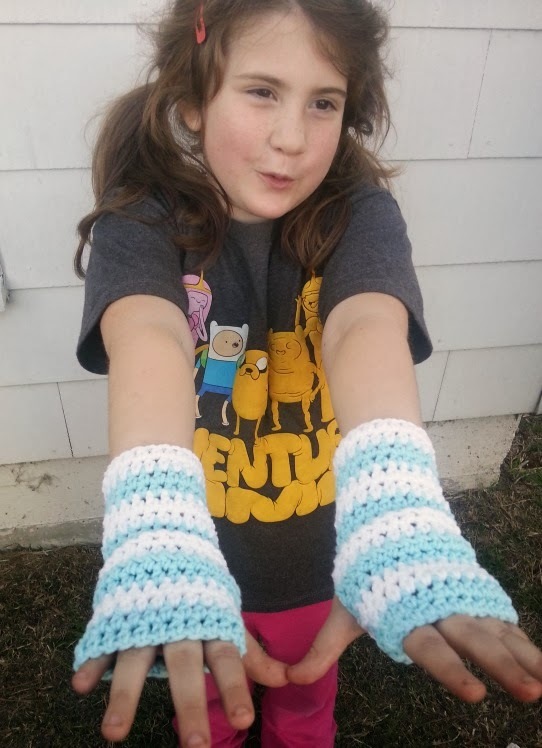 So it didn't surprise me that when Mims saw my new wrist warmers she wanted a matching pair. 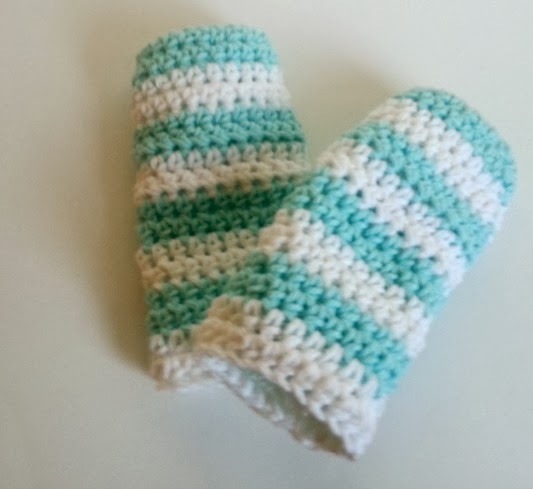 And since I am such an indulgent mom, of course I made her a pair. 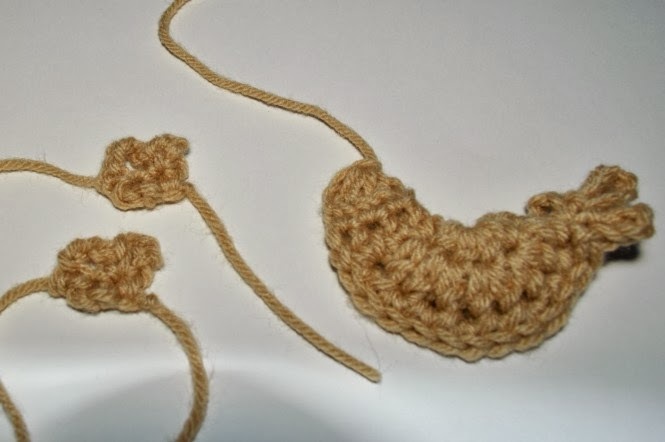 Of course, the fact that I could make the pair in less than an hour didn't hurt either! LOL!! Crazy simple, right?! And if you want to do the striped version you just change color every two rows (4 stripes of your main color, 4 stripes of your accent color). These are so perfect for winter fun! They're so fast and so simple to make that you can make a pair to match every outfit (even the ones that don't match with mom!). I know, I know. 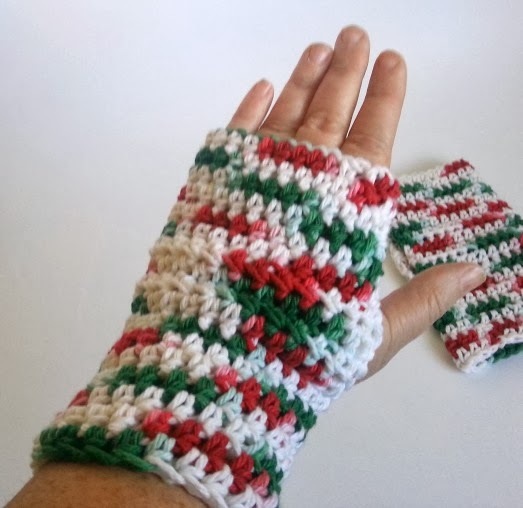 There are a ton of fingerless glove patterns out there. 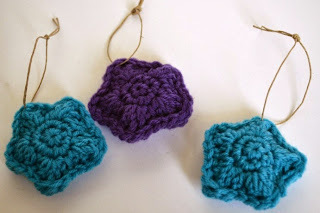 But these are so quick to make and so crazy simple these will be your hands down favorites! What makes them so amazing is that you can make a pair using only one skein of yarn and one hour. So that means that when you're watching back-to-back episodes of Scandal on Netflix you could be cranking out cute stocking stuffers for all of your friends. 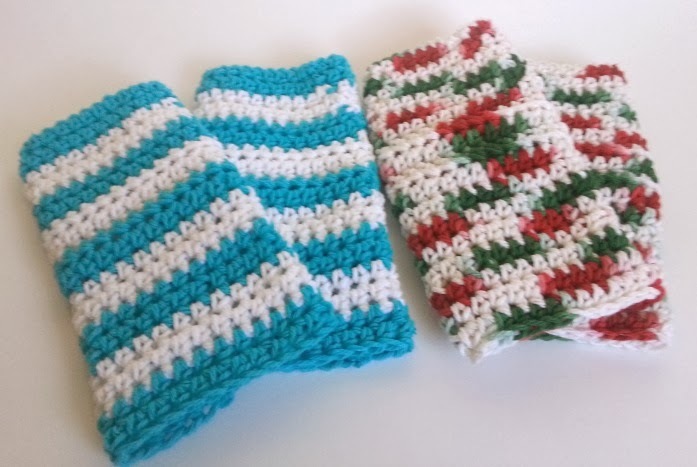 One episode, one pair of wrist warmers. Easy peasy, lemon squeezy! It's a win-win as far as I'm concerned. Crazy simple, right?! 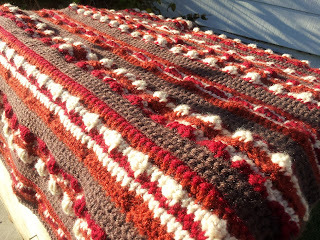 And if you want to do the striped version you just change color every two rows (5 stripes of your main color, 4 stripes of your accent color). So easy! Super gifty! I'll be posting the kid size version tomorrow! Edit 12/15/13: The crazy simple kid sized version is HERE! 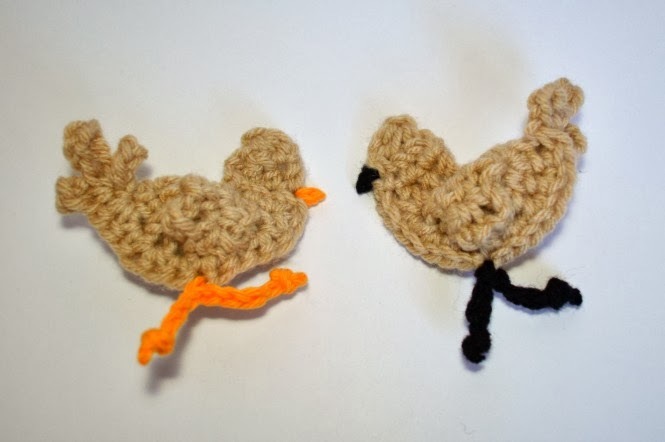 Make a pair for your favorite little buddy! It's time again for another post about my soap making progress! 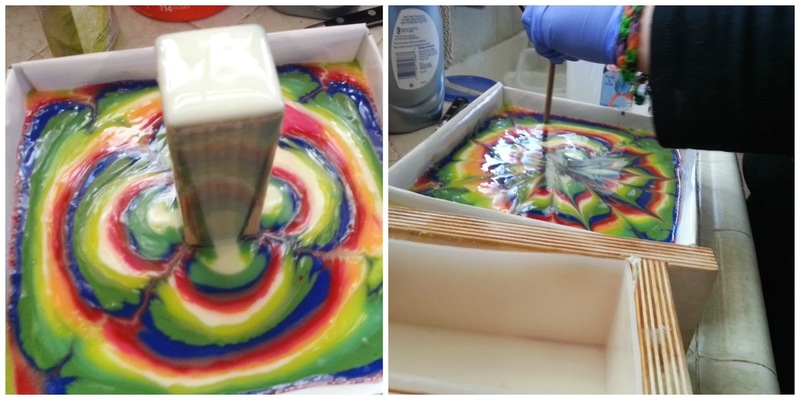 This month the soap class at Great Cakes Soapworks was a column pour. I was so excited. I had a new fragrance oil that I wanted to try, and even though the reviews said it might discolor, I figured I could just work around the discoloration by keeping some of the soap batter unscented. I began my pour and suddenly the batter got super thick and clumpy, which is pretty much the worst thing ever for a column pour. I got it into the mold, but it wasn't pretty. But once I cut it, it began to discolor and the not-as-obvious mistakes became glaringly obvious. 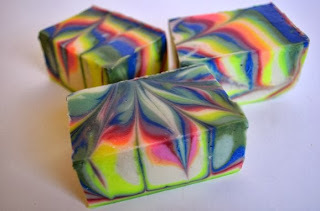 Clumpy pour means clumps of color in my soap! So I tried again. I tried a different fragrance oil. I was sure I had done something wrong with the last batch, so I mixed it to a very light trace and began my pour. Again, I got about halfway into it and the whole batch got very thick. It caused the top of the soap to wrinkle! Ack! I finished, and while it looked better than my first try, it still wasn't what I was looking for. 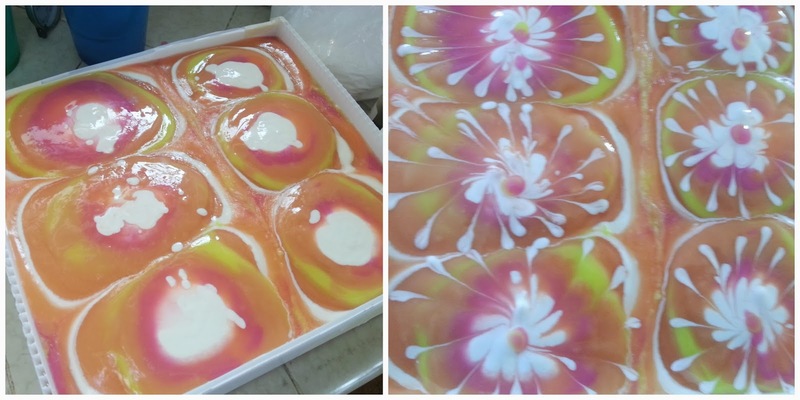 I didn't even bother taking pictures of the soap in the mold on this one. I knew that it wasn't going to be good. 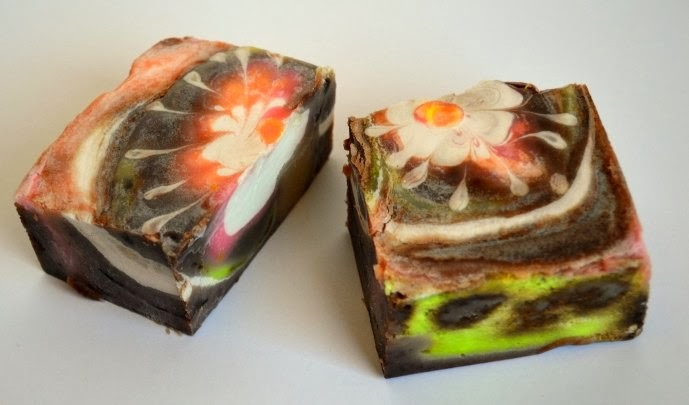 You can see that pouring at a thinner trace made the soap pour smoother, but the lines are still too thick and overall it's not the delicate stripes I had hoped for. I waited a few days before I tried again. Thankfully, in those few days, it occurred to me that it wasn't my technique. It wasn't the FO's I was using either. It was my RECIPE. I was using too many hard oils. 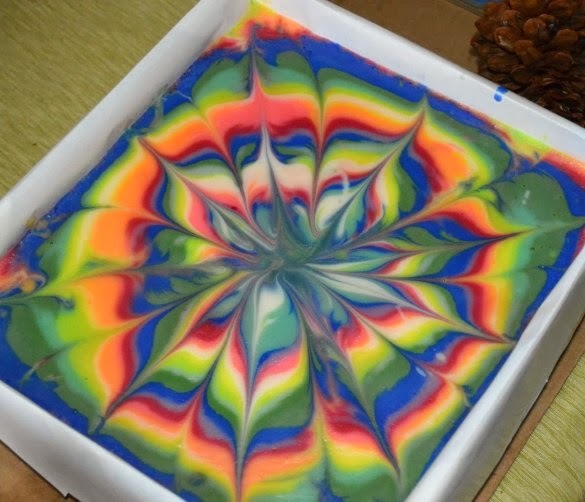 I tried a super basic bastille (just olive and coconut oil) and I only mixed the soap batter to emulsion, since I was going to try to column pour with 12 colors. And it worked like magic, just exactly the way it was supposed to. It poured smoothly! I had time to use all my colors. The soap didn't wrinkle! I had time to swirl through the top. Yippee!!!! This time the soap swirled beautifully! And it smells ah-MAH-zing!! 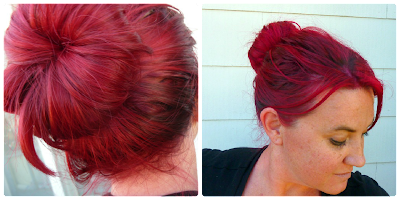 I used Rise and Shine FO from Bramble Berry. 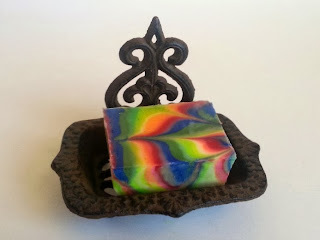 It smells fun and fruity, a little like sweet tarts and is a perfect match for my tye-dye look soap. My daughter is going crazy for it. Finally! Beautiful delicate lines! Exactly what I had hoped to learn! I'm glad I had a good reason to experiment with this technique because if I was just making soap to give to my friends and family I don't think I would have made enough batches to figure out what I was doing wrong. I think I would have given it up as a technique that was too hard and turned out too ugly. Now I am so excited to use this technique again and again! 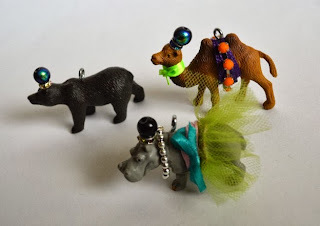 Every year I try to make a new set of ornaments for our Christmas tree. 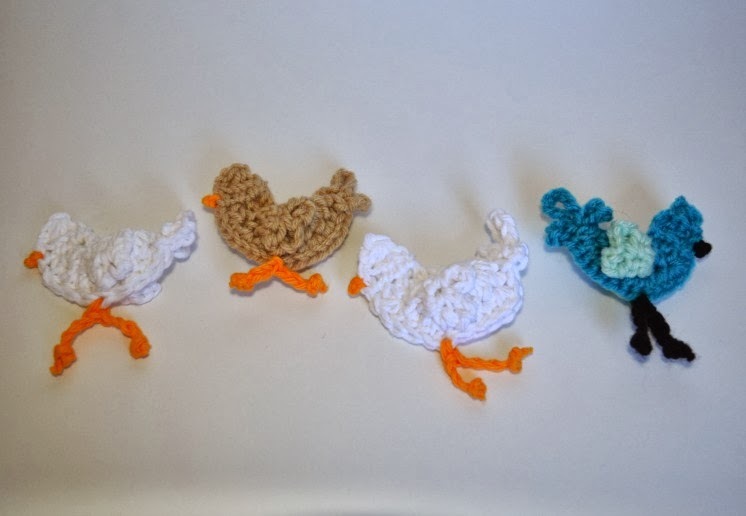 This year, in honor of our newest pets, I made some chickens! Our chicks are only about 6 weeks old, so they don't have their combs yet. Eventually they'll grow in, but for now their little heads are smooth with feathers... Thus, chick ornaments! Fasten off. 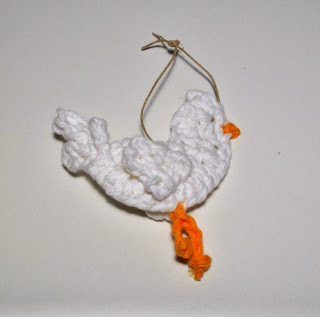 Leave a tail so you can sew the wing onto the chicken body. 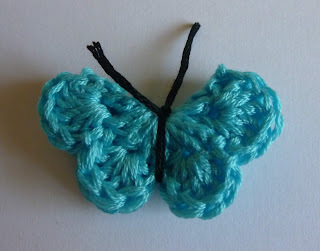 Place the wing slightly towards the front of the body (not dead center) and stitch it into place. Repeat on the other side! Pull the TAIL end of the yarn through the chain. Tug gently at both yarn ends to tighten beak. Cut the other end of the yarn and weave it up through the loops where you attached the yarn on the other side. Trim all ends! It makes a perfect beak! Fasten off. 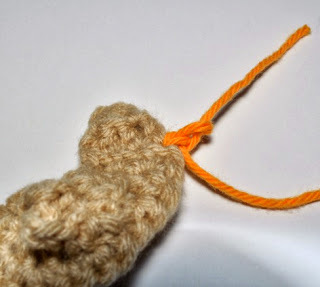 Use ends to help tie the bottom of the chain in a knot. 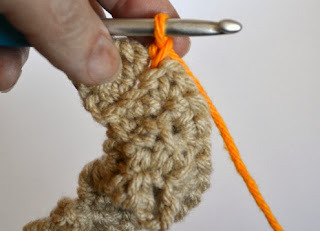 Tighten the knot as close to the bottom of the first ch as possible. Snip off any tail ends. 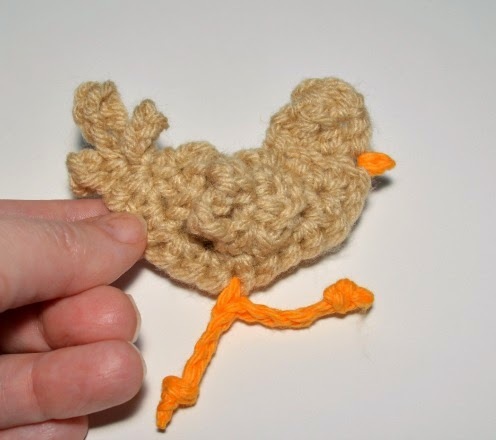 Using your yarn needle, run the hemp cord through a stitch in the top of the chicken's back. 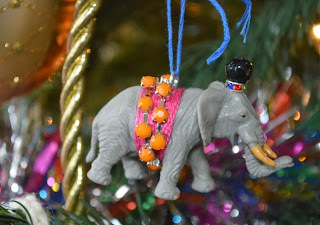 Tie the ends together in an overhand knot to make the hanger (you could also use an ornament hanger, if that's more your style). 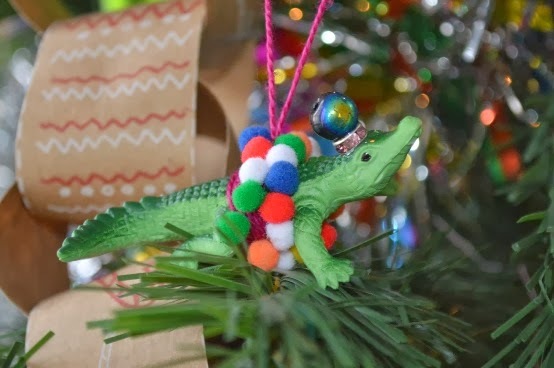 Now go hang it on your tree! Use them as gift toppers! Give them different colored beaks and legs! And have fun! 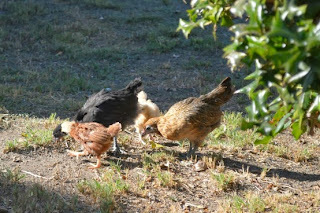 We have chickens! About 6 weeks ago we were having some difficulty with our washing machine and the repair guy that came out turned out to be a neighbor. We got to talking and he suggested that we get some chickens because his are doing really well in this area. I know, random right? That same day I got an email saying that the farm at our fairgrounds was offering a class on Raising Chickens in an Urban Environment. It was free. I took it as a sign that we were supposed to go. So now we've got 4 chickens in a rubbermaid tub in our kitchen. They're almost big enough to live outside, but I'm going to give them a few more weeks because it's cold and I don't want to put them out too early. Mims is happy! I'm happy! Jake is maybe less happy, since he's the one that cleans the tub... I keep telling him it will all be worth it when we have amazing fresh eggs. Marceline is named after Mim's favorite cartoon character, Marceline the Vampire Queen from Adventure Time (Our Marceline is a Black Australorp). Little Red is a Rhode Island Red. Buffy is a Buff Orpington (and named after MY favorite Vampire Slayer). And Suzy is actually named Tiramisu-zy but we've shortened it down (she's an Americauna which is the "easter egg" laying breed. Her eggs will be green or blue or pink!). Oh! And than you to everyone who downloaded my books last week. I ended up giving away over 13,000 books to people in 11 different countries!! How amazing is that?! Thanks for spreading the word and the love, Dynamos!! 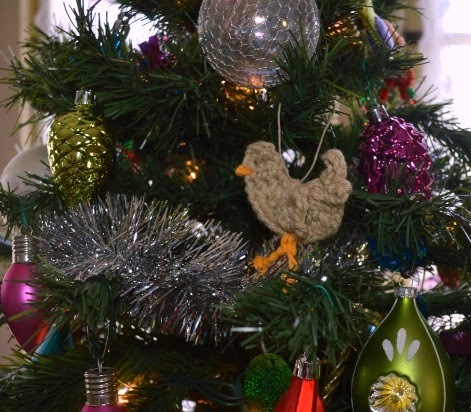 I think the only downside of having an artificial tree is that it doesn't smell like Christmas. My best friend Deb (she prefers that to Mom-in-Law, LOL!) always gets a live tree so in the past I've just been able to go over to her house and get all my pine-y love in. This year she moved up to Northern California and we miss her so much, especially now because I have no yummy live tree smells to help me celebrate the season. So when I was in Target the other day I got so excited because I saw the most awesome thing ever. 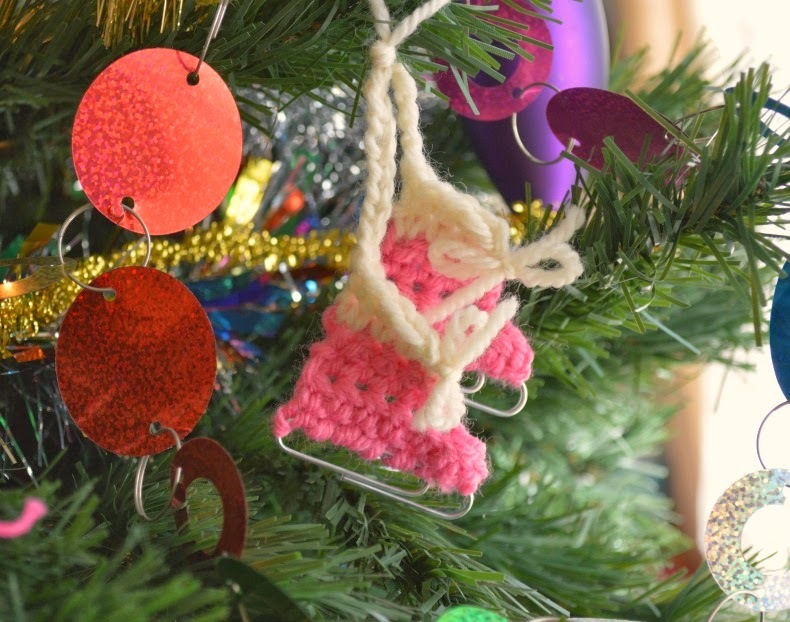 Pine scented ornaments to hang on your artificial tree! Brilliant! And then I saw the price, which was cheaper than a live tree, but not by much. Not so brilliant. Disappointed, I put them back. 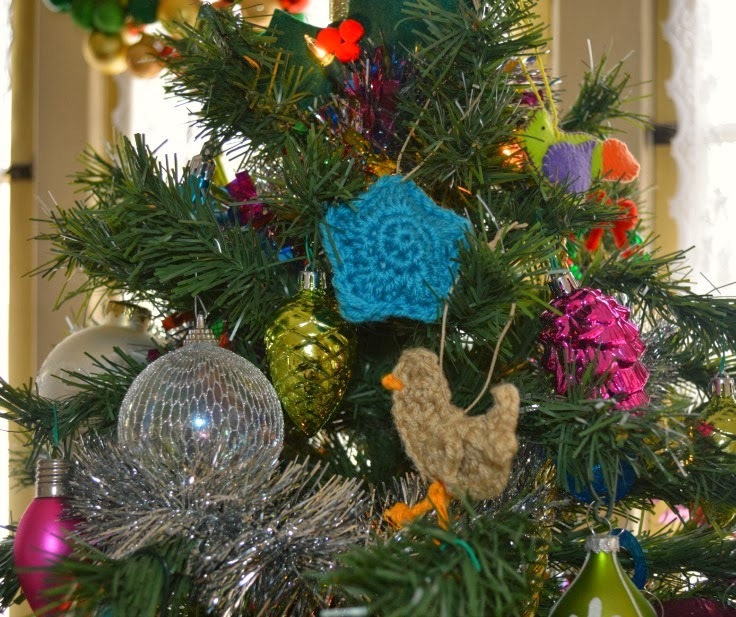 But happily, by the time I got home I had thought of a way to make my own pine scented ornaments! Why yes, my little scented star is hanging out next to a chicken! I grabbed a hook and some yarn and it didn't take long to whip up 3 little star ornaments for my tree. 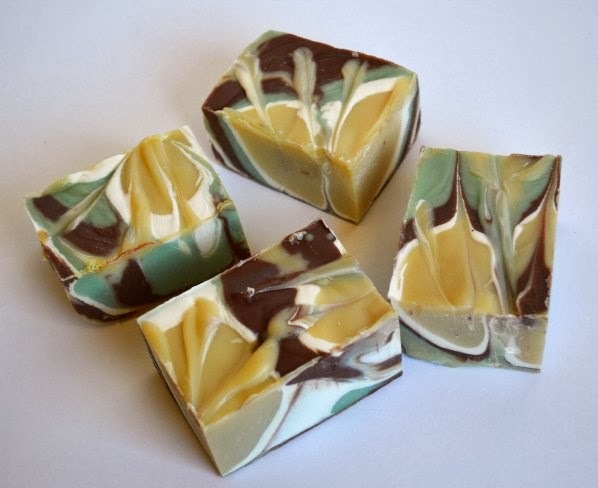 I used some spruce scented fragrance oil that I had just used in a batch of holiday soap for the scent. It's pretty awesome! I didn't realize how much I missed the piney smell until I came home from shopping and the whole house smelled like, well, Christmas-time! I can't believe how easy and ridiculously cheap these were to make. I can't imagine ever having another holiday season without them again! 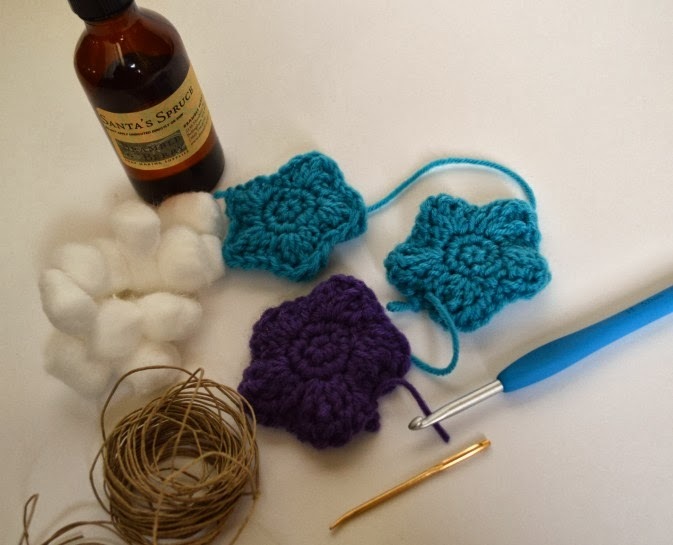 Finish single crocheting around your star (or whipstitching, if you prefer). 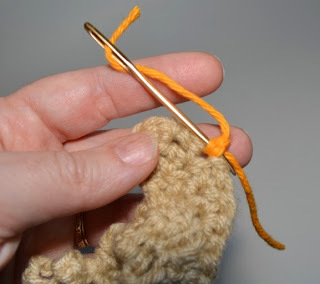 Fasten off and weave in all ends. 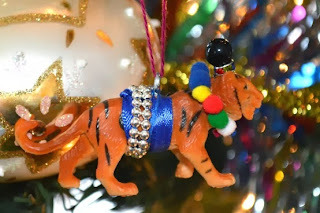 Hang that sucker on your tree and enjoy the holiday cheer!! I added 3, which was just the right amount of good-smelling-ness for our home. 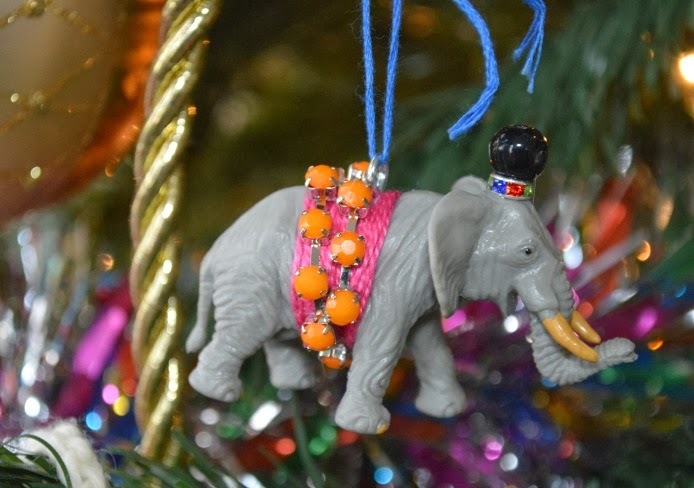 They've been hanging on our tree for about a week and it's still delightful to come home to the Christmas-ey smell! Oh, and today (12/7) is the last day of Saint Spoiling's Week! Last chance to grab your free books! xo!